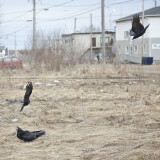 The photographs are taken around my home in Moosonee, Ontario where I feed Ravens along with other birds. 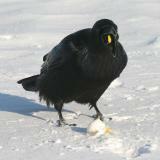 The Ravens enjoy many things including eggs and meat and also cheezies. 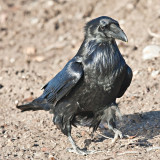 Most of the other birds avoid getting too close to the Ravens. The Starlings are an exception and seem to have no fear of them. The Ravens are not that interested in most of the other birds but dislike both Crows and Seagulls quite a bit. I have seen a Raven that was annoyed by a Seagull grab the gull by the wing and swing it around and then resume feeding. Raven on bottom member of truss under roof of shelter above public docks. Frosted raven on a snowy lawn 2015 October 17th. 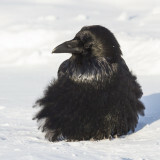 Headshot of raven, probably older juvenile, sitting on vent stack in Moosonee. 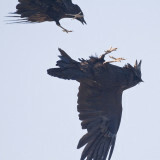 Adult raven with food in front of two juvenile ravens with their mouths open. 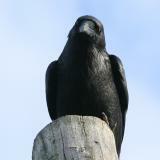 Raven on a roof, looking upwards. 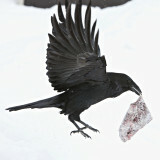 Raven retrieves an egg from an eavestrough. 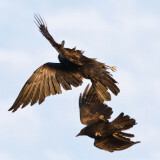 Two juvenile ravens in flight. June 25 2014. 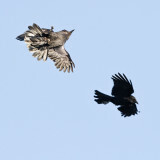 Juvenile raven on service master. Another on roof below. 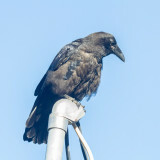 Juvenile raven on service mast. 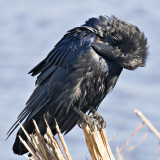 Raven with nictating membrane closed over eye. 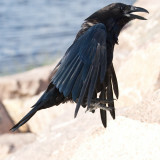 Head shot of raven with beak open. Close up of eye of raven. 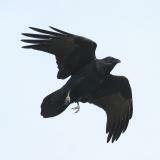 Close up of eye of raven showing reflection of photographer 2014 June 25th. 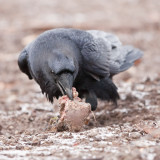 Adult raven with lard feeding two juveniles. 2014 June 24th. 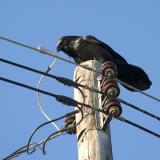 Raven sitting on vent stack in Moosonee 2014 June 22nd. 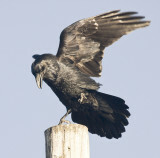 Adult raven sitting on railway track. 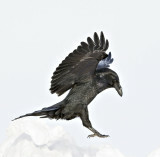 Raven flying out onto the frozen river. View from behind. 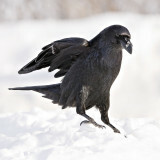 Raven walking on hard snow. 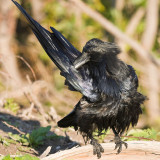 Raven, chuffed up, nictating membrane over eye. Raven headshot, reflection of photographer. 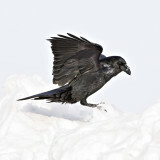 Raven chipping away at snow near railway bridge. Raven with snow cover waiting for sunrise. Raven on a cold morning. Feathers puffed out 2013 December 13th. 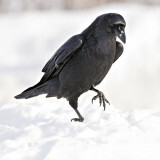 Raven on the snowy grass. Used flash and raven did not seem to notice. Juvenile raven on the grass 2013 July 30th. Raven looking ahead, nictating membrane closed over eye. 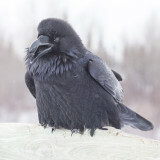 Raven on railing at Store Creek rail bridge in Moosonee 2013 February 21st. 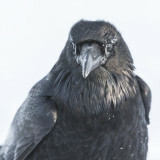 Raven, snow around eyes, 2013 January 20th. 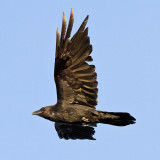 Raven in flight, wings bent. 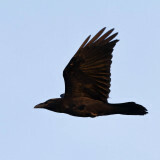 Raven flying along river's edge lit up by setting sun. 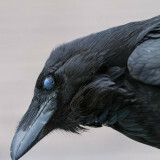 Raven's eye - can you see the photographer? 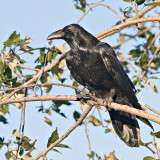 Raven in tree, fluffed up. 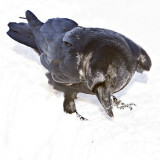 Raven digging to cache food. May I use one of your photos for source material for a drawing/painting? What do you charge? Thanks for sharing your wonderful photos. May I have permission to sketch one of your ravens for a pen and ink portrait? 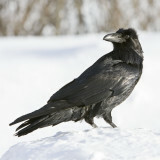 Dear Steve, Could i have permission to sketch one of the ravens for a pen and ink portrait? Beautiful photos of a beautiful bird! 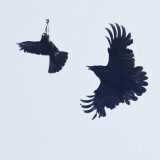 Was looking for some good flying raven's photos, and here I found some really good ones. Thank you very much! to no end. I have fed a pair of them for years, observing and taking pictures...none look like yours.. Your work has inspired and allowed me to paint a series of paintings with ravens and other animals; a years work. I am so grateful. Words can't express. Thank you for your gorgeous photos! 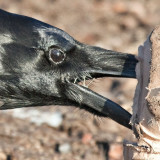 Currently working up a soapstone carving with Raven. Your gallery is wonderful. That is an amazing photo collection. I looked you up to see ravens for a clay piece I am making. Wow I had so many beautiful head shots to see. Thank you so much! all I can say is thank you for the intimate look at the life and antics of this magnificent and intelligent creature. 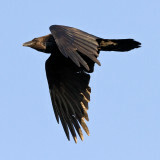 we, as a species, could learn so much from this corvid, or any animal for that matter. Thanks for the incredible images. 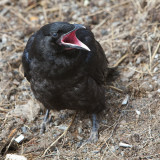 When I was a kid of 10-11, I raised an American crow from 2-3 days old. I had JoeJoe for ~4 years. 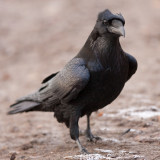 Corvids are such wonderful creatures! Thanks again for sharing this wonderful images! Thank you for the beautiful images. I too love ravens and am moved by your work. 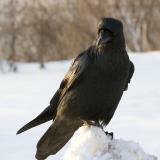 I live in a mild climate and visit ravens and crows daily at various locations. There does seem to be animosity between them but I have noticed when the alarm call goes out amongst the crows as a hawk approaches, the raven often joins the mob in chasing it off. I am painting Odin on his throne, he needs a raven on each shoulder. Thank you so much for the models! 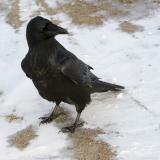 I too have a love for the Raven, I wouldlove to feed them but my neighbors complain. I live in the mountains of NM. There are so many here. I love to listen to them talk. such beautiful pictures! thank you for sharing these and capturing an incredible animal! Carving a pair of Raven dishes 4" x 4" x 12" in yellow cedar. Needed to see better wing shapes than my rusty imagination can recall. Think I can move ahead. Thank you. These are beautiful images. 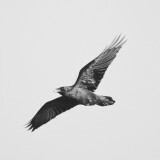 I am most impressed by those shots that show the relative size of the raven with other well-known birds, such as eagles and crows, or those that play with light, changing the black to something else. 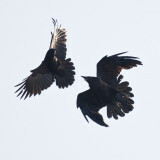 My favourite images of the raven on the June 5 pair - LOVE those silhouettes! You have spent a lot a time recording this wonderful bird, thank you for sharing. Great! 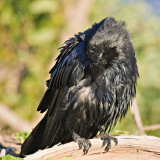 These pictures are really amazing and provide a very good insight into the life of ravens. Thank you for this excellent gallery! Wow! Your pictures are astounding. 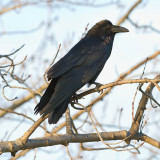 I love Ravens and have some nesting behind my house but they are very shy here. 3 successful fledglings, and I see the 5 of them every day. I WISH I could take pictures as good as this of them. Thanks so much for sharing these - it really makes me happy to see such great views. These pictures are amazing! You have helped me so much in my A level art project - Thank you! Stunning picks, love Ravens, they're kinda wicked birds but can't help admiring their beauty and your images do them justice. your gallery of ravens have inspired my next raven tattoo...Ironically the first raven tattoo is the same as that book cover. Great shots. 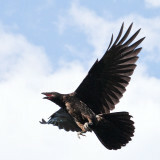 Did you see the 1st of its kind Raven shot in the June 2010 NG mag, Paul? 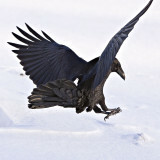 Thanks for this photos, i love ravens. Stunning body of work. I am reading a wonderful book by Bernd Heinrich about the life of the raven. These pictures really compliment my readings and studies about these wonderful creatures. I did have the joy of seeing them in the Adirondacks, NY in mid September. They are so intelligent and very aware of their environment! Thanks again and Greetings from Switzerland! 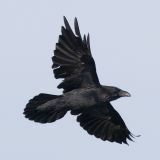 I've got a picture of a raven on my latest book 'The day the Ravens died', I wish I'd seen these pics, I'd have done a deal to have had one of yours instead! I write under the name Timothy Pilgrim, and my ravens were those at the Tower of London. 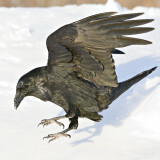 The best raven images I've ever seen! Great to see that everyone else loves ravens so much too. Just spent a bunch of time looking through these. My girlfriend and I love ravens, and enjoy your photos a lot. Hi Paul,I am a big fan of your work. Presently I am illustrating a children's book for the SD Historical Society (Raccoon & the Bee Tree) Of course I must use many SD animals in the illustrations. 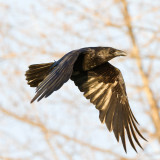 Your Raven photos are great. They will help me a lot. Great work as always! Those pictures are very nice, thanks for sharing them with us. 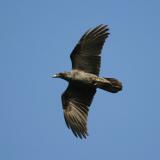 It would be cool if you could add the name of the subspecies too (Corvus corax is only the species). Some anectodes would be fun too. 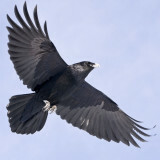 i have dreaming up a tattoo of a raven for over 9 yrs. i could never find the perfect poser or combo of photos to get this idea out of my head.a raven flying directly towards you...well i have 7 crow/raven tattoos. i just stumbled across your site thru google. i have never seen such amazing detailed beautiful shots like these. i can finally use these as a guide to design my dream tattoo! thank you so much!! 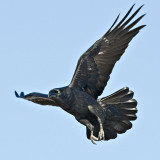 Thank you SO much, Paul, for these incredible photos of wonderful, powerful, beautiful Raven. 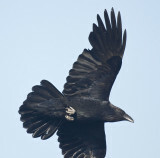 Raven is one of my constant guides, and your pictures are a delight. 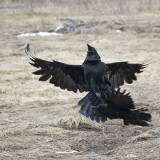 I especially love the photos of Raven carrying eggs! Blessings. 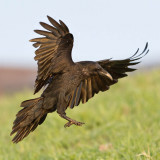 you have definetely one of the most beautiful photosites on crows/ravens. I feel lucky i came across it. I especially love the action pictures, the birds landing, taking of or in flight. One doesn't see many photos like that on other sites. 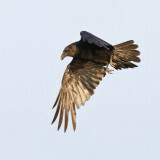 Thank you Paul for your wonderful clear photos of all aspects of Raven flight and movement. I feel I understand their anatomy so much more now. I wish I'd seen these pictures before I did my sculpture of a Raven shouting into the wind, I'd have been much less puzzled by certain feather arrangements. 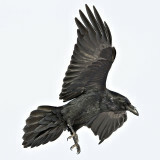 We have Ravens here in the South West UK, but although I hear them croaking through my studio ceiling as they fly overhead, they never come close. Beautiful photographs, that really get inside their world. Thanks again. Ama Menec - Sculptor, Totnes, Devon, UK. 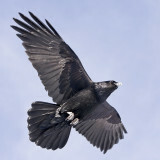 I don't know why but ravens and crows are my favourite birds. Something almost mythical about them. Like the pics. Also like your photos of other subjects. Any raven's head close ups ? I have been fortunate to live much of my life in Alaska, Montana, Idaho, and Washington. 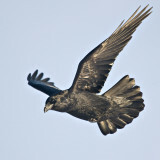 Coming froma farm in Nebraska and into the Air Force at age 17 I was familiar with crows but had never seen a Raven. How exciting the first time I saw them at play!! They are my favorite bird, possibly favorite animal. Their vocabulary, intellegence, courage and playful spirit never ceases to entertain me. I had no idea there were so many other folks out there that enjoyed them as much as I. This is a wonderful site Paul. I refer to it frequently when I need a little spirit break at work. Thank you very much. thank you ! great pics ! I love the detail of the feather patterns. 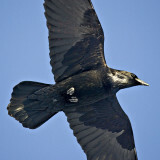 All the large "black birds" in my area died off with the West Nile virus several years back. 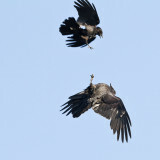 They performed such amazing aerial maneuvers. I miss them. I'm not sure if they were crows or ravens. I used to think they were one and the same. I know better what to look for now. There are Peregrine Falcons in my area. This winter I noticed one in a tree right after it had caught and killed a smaller bird. It ate some then sat on the little body in that tree for several hours until dark. I have about 600 pictures of the duration. Some are better than others. 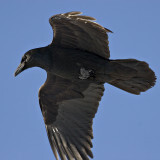 I live across from the Government Center in Ventura, Ca where four Ravens have flown around for several years. Every time I see them flying, I stop what I'm doing and watch. Most people in the apartment complex don't know what they are missing by not watching. I also saw a seagull chase a Raven that had some food in it's mouth and another Raven flew up behing the gull and grabbed it by the tail feathers. Very intelligent birds. Thanks for the background picture. I agree coraxgirl. 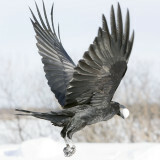 These are the some beautiful raven pics on the web. Thank you. Oh my, these are great!! 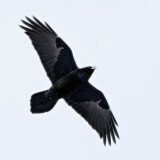 Where I live (central Illinois and part-time Southern Indiana) we don't HAVE any ravens, but I'm writing a tale of shapeshifters, one of whom is Raven--and really needed to see, close-up, how they look, the expressions they might have, etc. Your photos are very telling indeed - make me feel that I'm right there watching! Thanks a million! 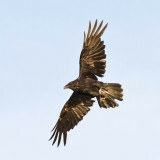 If there were any ravens where I live, I'd surely photograph them, as I do any hawks & the like that get within range. My neighborhood corvids are too wary of people...I can only catch a shot of them way up in the tallest trees! Beautiful series dedicated to a very beautiful bird! Terrific gallery, Paul. 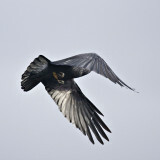 You have some wonderful images which are obviously inspiring even to those who have never seen a live raven. Great work. Voted. 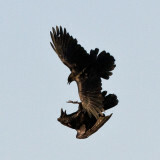 the most amazing series of Raven photos. Wonderful sources for my paintings, thank you! I live in the desert region of So. Calif. and we love these birds, which have become the subject of much of my art. I will use your images as reference for my next tattoo - thank you. The images are better than I expected to find on the internet! Wonderful photographs of an amazing creature. 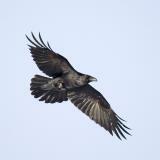 We are lucky enough to see Ravens regularly here in the Highlands of Scotland. 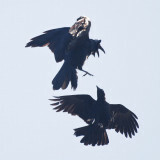 I have watched pairs doing spectacular synchronised flying and watched them grasping each others feet high in the sky and spinning to within a few feet of the ground before letting go of one another. They enjoy the excitement of flight in a way few other birds do. your pictures are beautiful. i had no idea of the beauty and grace of these birds. 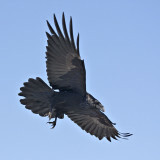 we have a lot of crows here in southern california but i am always on the look out for the exceptional raven. the picures are thrilling and real, putting a smile on the face of someone appreciates the complex personality of this black bird. 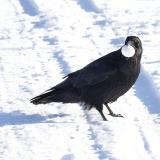 Love all of these photos, I am a huge fan of the clever corvid. 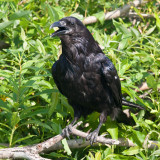 I have 2 pair of mated crows, that I have fed for the last 4 or 5 years. Raven and crow hold a very special place with me, their intelligence and what appears to me to be a sense of humor, I have watched them antagonize my cats for what I believe is the fun of it. Sometimes I would swear I could hear them laughing. Thanks for posting these, I will check back to see it any new ones show up. 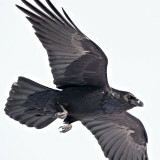 Paul, these are the best Raven pictures I have ever seen and I look everywhere continuously. You have a Raven book here for sure. These pictures are beautiful! I love them. 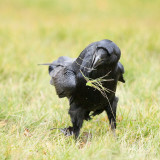 Ravens are such elegant creatures. EXCELLENT. 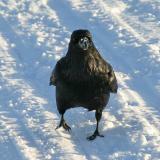 I've been a fan of corvids for years. Saved a group of blue jays from cats after their nest was blown from a tree during a tornado, but ravens have always held the dearest place in my heart. I named my daughter Morrigan after the Celtic goddess, who took the form of a raven. 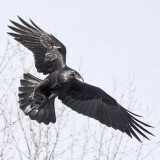 I'm about to get my back done in a raven, with wings spread, from shoulder to shoulder, and I may use one of your pics. I have never seen anyone capture them so well, and the photo of the feather-prints in the snow is poignant in some way I haven't the words to explain. I bow to you sir. I love your work. I am a sculptor who would love to have the eye you have. Where I live, we have no ravens, but the crows bring me pleasure. Is it possible for me to purchase one of your prints? I have my eye on one in particular. 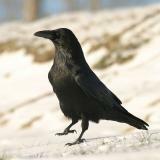 This is the best collection of raven photos I have seen. 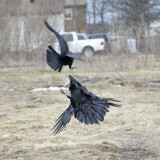 I am not lucky enough to have them in the area in which I live, so I mingle with the crows. Do you sell any of your work? I would be interested in having more than a few of your prints. Thank you. 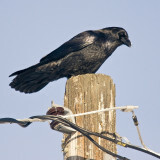 Love your Raven Pictures! 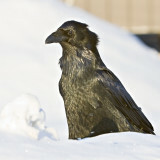 Have you ever read the book "Ravens in Winter" by Berndt Heinrich? 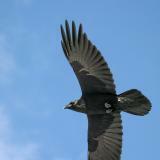 Also, a great Native American trickster tale "How Raven Stole the Sun" from the Northwest Coast Tlingit traditions. It's odd but this bird seems to follow me around. Thanks for sharing your beautiful pictures and showing everyone what wonderful birds they are!! 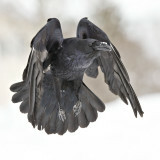 These are some of the best photos of ravens I have ever seen. Absolutely wonderful. 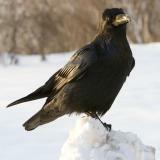 I love your Raven images. I have never seen so many great images of Ravens in one place before. I want to thank you for your generosity in letting me use some of the images in my art work on Zazzle. I appreciate the gift. Paul thankyou for your amazing photos. I'm currently making an art quilt of the Murray Mallee and wanted to hand embroider some Ravens as they are common in this area and a loved bird of mine. Your photos will help me to get an accurate embroidery. I am a sort of artist and one of my favourite subjects is the raven. Thank you so much for your wonderful photographs. 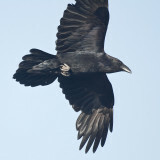 I live in the country surrounded by ravens and you have caught their incredible intelligence and beauty perfectly. I have used your photographs as guides so far for a painting and two sculptures. I am now planning to do a fused glass piece of a flying raven, using some wonderful silky, opalescent glass that is perfect for the feather colours. Thank you. Excellent pictures of a beautiful bird! The best raven pictures of the internet! 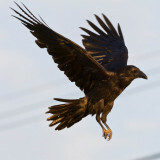 Great raven photos. I have looked all over the web and these are the best! 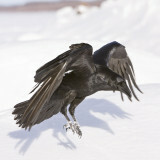 exceptional photographs especially of ravens flying! 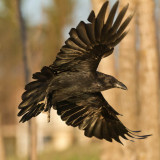 I like these raven pictures alot, really good captures. 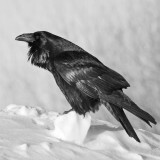 Thanks for commenting on my raven photo from Norway. You really have some great shots of raven of your own. Outstanding work! Great to see another person who appreciates this amazing bird. Excellent gallery. One of my favorite birds. I used to feed a pair of crows a few years ago. They'd come when called and actually follow my dog and I along the street for a few blocks if they spotted us. I could never get any good shots of them that showed as much detail as yours. Bravo. 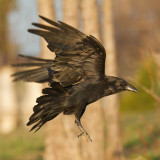 Thanks for commenting on my raven photo. 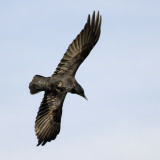 You have some great raven photos of your own. I especially like the action shots. 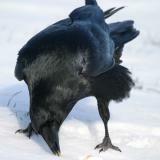 I really enjoyed all of your pictures, espically your raven gallery. 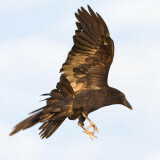 Nice high quality pictures of some very beautiful birds. Raven's End - not sure but did look it up on amazon. Thanks for bringing to my attention. These are great photos, and must have taken some time to capture. Have you heard of Ben Gadd's book Raven's End? It's a fab read for corvid fans. I'm lucky to have a couple that are around regularly and sometimes see half a dozen flying around especially in the morning. I enjoyed Heinrich's books and Bird Brains as well as one called Ravensong that has just been reissued. 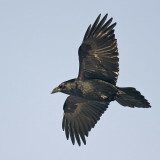 Also a Natural History of the Raven in the Britain and Ireland. 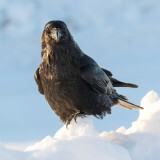 The ravens are the only corvids here in winter, in the rest of the year there is a lot of unfriendly interaction between them and crows. 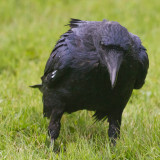 Hello Paul, I'm really enjoying your raven photos. I've been a long time raven fan since reading Bernd Heinrich's books (too few photos and not well printed unfortunately) and a book titled Bird Brains. 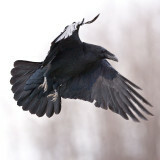 There is only one raven here and he never comes to my window feeder--just the scrubjays and acorn woodpeckers. That book and his later book really inspired me a lot. Reminds me of "Ravens in Winter".